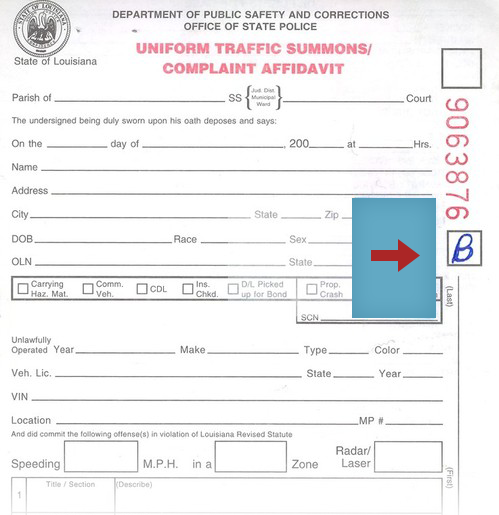 If you were issued a citation by Louisiana State Police, Lake Charles Police Department or Sulphur Police Department AND it has a "B" in the box as shown below you must click here for more information. All other citations please read below. Appear in court on the date noted on the citation to contest the citation and you will receive a trial date. What court do I contact? If you wish to contest your ticket in court, please appear in traffic court on the date specified on your ticket. Should you miss your traffic trial date, a bench warrant will be issued for your arrest. In addition, your driver’s license will be at risk for suspension.